When you become a parent, you quickly realize that the responsibility for the safety and well being of your child lies with you. Babies come into the world curious and eager to explore their environment, but since they have not yet learned about the dangers around them, they rely completely on their parents and other caregivers to keep them safe. Not surprisingly, most of the greatest dangers to babies are in their own homes. Things that seem harmless enough to us can pose risks to the youngest members of the household, so it is important to go through your home, room by room, taking care to reduce the risk of injury to your child. Cot slats should be at least 6 cm. apart to prevent the child's head from getting trapped. Never use soft bedding, pillows or stuffed animals in cots for infants as they pose a suffocation hazard. Babies should always be placed on their backs to sleep. Mobiles should be removed once the baby can push up on their hands and knees, usually at about 5 months. If you use a changing table, be sure that it has sturdy guardrails and a safety strap. Keep all supplies within reach and never leave your baby unattended on the table, even for a moment. Keep all small toys away from the cot since many are choking hazards. Place the baby's cot away from any windows and be sure that no cords are hanging from the window treatments. Safe window treatments have break away cords to eliminate strangulation hazards. Store cleaning products in a high cabinet or if stored under the sink, be sure that the cabinet has a child proof lock. Kitchen drawers should have stops on them to prevent babies from pulling the drawers down onto themselves. Store all sharp kitchen utensils in the highest drawers. 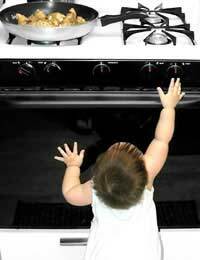 When cooking, be sure that the handles of pots are facing to the back or side, not out in front. Once babies are walking and climbing, they will begin to reach for things above their heads. Avoid heating baby's bottles in the microwave because it heats the liquid unevenly, leaving hot spots. If you do use the microwave, be sure to mix the contents well after heating to assure even distribution of heat. Be sure that highchairs are properly equipped with safety straps. Keep a fire extinguisher close at hand and familiarize yourself on its use before you need it. Tape down long electrical cords so that baby can't pull lamps or other items down on themselves. Carpeted floors prevent some slipping and provide a softer surface for learning walkers. If you have tile or hardwood floors, consider letting baby walk barefoot or with skid-proof footwear. Stairways should be securely gated at both the top and bottom. Avoid old fashioned accordion style gates since they can pinch baby's fingers and often have openings that are large enough for a baby to crawl through. Anchor unsteady items, such as bookcases and entertainment centers, to the wall. Consider installing cushions to the corners of tables. Keep floors and low tabletops free of coins, paper clips, buttons, and other small items that pose choking risks to babies and young children. Set your hot water to no higher than 49° Celsius to avoid scalding. Never leave your baby unattended in the tub or bath seat. Install lid lock on toilets and keep the lids closed when not in use. Be sure that all medications are in child proof containers and are stored in a high cabinet, preferably one that locks. Unplug and store all electrical appliances, such as shavers and hair dryers, when not in use. Store household and yard care chemicals in locked cabinets. Unplug power tools when not in use and store them and all hand tools out of the reach of children. Modern automatic garage door openers will reverse the door if it touches an object. If you have an older garage door opener without this feature, consider replacing it. Young children can be crushed by heavy garage doors.